Your gums can take a lot — they’re resilient and they endure a variety of abrasive foods over a lifetime. But resilience isn’t the same as invulnerability: your gums can be weakened by periodontal (gum) disease or by over-aggressive brushing that causes them to shrink away (recede) from the teeth they protect. 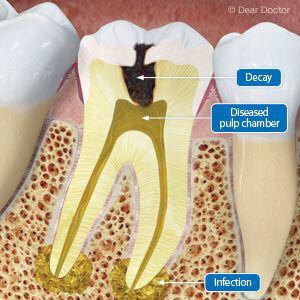 Unfortunately, it’s not a rare problem — millions suffer from some degree of gum recession, caused mainly by gum disease. This aggressive infection arises from bacteria in dental plaque, a thin film that builds up on tooth surfaces due to inadequate oral hygiene. Fortunately, gum disease can be effectively treated in its early stages by removing plaque above and below the gum line. 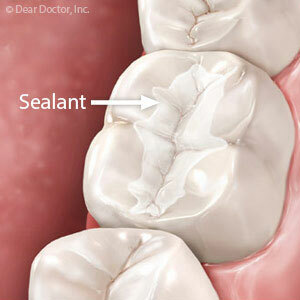 Diseased gums will quickly rebound to their normal health. 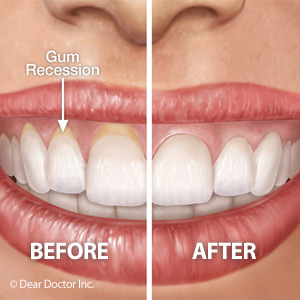 Unfortunately, though, heavily recessed gums from advanced stages of gum disease (as well as those who’ve inherited thinner gum tissues and are more susceptible to recession) may not come back fully without help. This can affect the health and survival of affected teeth, as well as your appearance. Plastic periodontal surgery can help restore these lost tissues. There are a number of procedures that can be used depending on the exact nature of the recession, and most involve some form of tissue grafting. A specimen of donated gum tissue (either from another portion of the patient’s gums or a thoroughly cleansed and properly processed donation from another person) is surgically attached to the gums at the recession site. The graft can be completely freed from the harvest area or in some cases a part of it remains attached to receive blood supply while the rest is grafted to the site. These procedures, especially the latter, require meticulous skill and sophisticated microsurgical techniques to make an effective attachment. If the tooth root is involved, it must be thoroughly prepared beforehand through polishing and decontamination to ensure the new graft will take. The graft is sutured in place and sometimes covered with a moldable dressing for protection. As the area heals, the tissues begin to grow around the graft, restoring better coverage for the tooth. Coupled with comprehensive gum disease treatment, this form of plastic surgery can restore new health to teeth and a transformed smile. We’re all familiar with tried and true traditional braces and perhaps with newer clear aligners for realigning teeth. But there’s an even more novel way that’s quickly becoming popular: lingual braces. This type of braces performs the same function as the traditional but in an opposite way. Rather than bonded to the front of the teeth like labial (“lip-side”) braces, these are bonded to the back of the teeth on the tongue (or “lingual”) side. While labial braces move teeth by applying pressure through “pushing,” lingual braces “pull” the teeth to where they need to be. Although lingual braces are no better or worse than other orthodontic methods, they do have some advantages if you’re involved in sports or similar physical activities where mouth contact with traditional braces could cause lip or gum damage, or if your work or lifestyle includes frequent snacking or eating, which requires continually removing clear aligners. And like aligners, lingual braces aren’t noticeable to the outside world. But lingual braces typically cost more: as much as 15-35% more than traditional braces. They can initially be uncomfortable for patients as the tongue makes contact with the hardware. While most patients acclimate to this, some don’t. And like traditional braces, it’s hard to effectively brush and floss your teeth while wearing them. This can be overcome, though, by using a water flosser and scheduling more frequent dental cleanings while you’re wearing them. For the most part, lingual braces can correct any poor bite (malocclusion) correctable with labial braces. 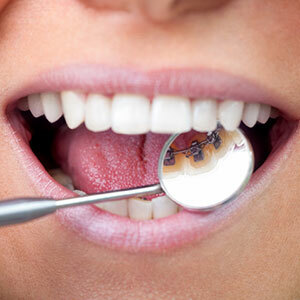 The treatment time is also comparable, ranging from several weeks to a couple of years depending on the malocclusion. And, as with any other orthodontic method, you’ll need to wear a retainer once they’re removed. Lingual braces have only been available in a limited fashion for a few years, but their availability is growing as more orthodontists train in the new method. If you’re interested in the lingual braces approach, talk to your orthodontist or visit www.lingualbraces.org to learn more.